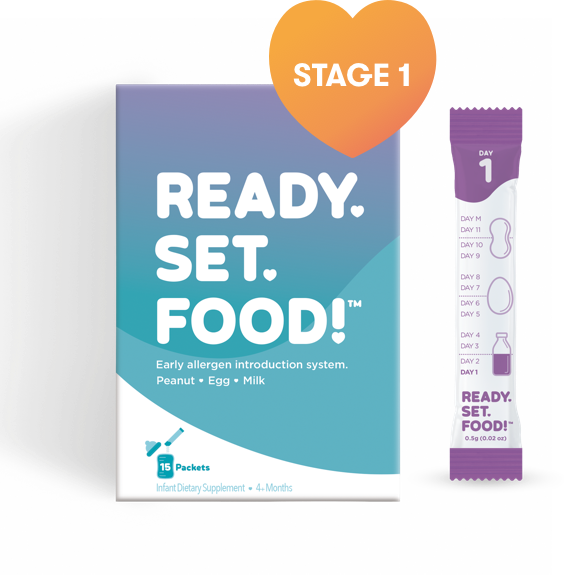 Infant Dietary Supplement | Ready, Set, Food! Introduce your baby to one food at a time. Organic and all natural. No added sugar, additives, or preservatives. Just 3 simple ingredients. I think of this as a miracle product. We have begun the subscription and so far everything is looking great! Too many kids are developing allergies so why not halt it before it begins? I love that it's only 3 organic ingredients and nothing more… Cheers to reducing allergies. Keep it up guys! We fully stand behind Ready, Set, Food! and if you are not 100% satisfied with your purchase, we encourage you to connect with us via email, live chat, phone or private message on social media so we can help you to cancel your subscription. You can also do this on your own by logging into your account (if you did not create an account or cannot find your account, you can activate your account in order to gain access to our account portal by using the activate your account tool) to get access to our account portal. Once there, click the “Manage Subscriptions” button. Once there, you’ll see your active subscription(s), and under the “Actions” column, select “Cancel”. You’ll then be prompted to answer a multiple-choice question on why you’re choosing to cancel. Once answered, you’ll be redirected to your subscriptions page, which should then display your subscription as “Cancelled” under “Next Charge Date”, and under “Actions”, only an option to “Re-activate”. Why do you recommend starting Ready, Set, Food! as early as 4 months old? Thanks to three major clinical trials around early peanut, egg, and milk introduction, scientific evidence shows that the ideal window of opportunity to expose your baby to food allergens is around 4 - 6 months of age (and possibly earlier) in order to reduce their risk of developing a peanut, egg, or milk allergy by up to 80%. 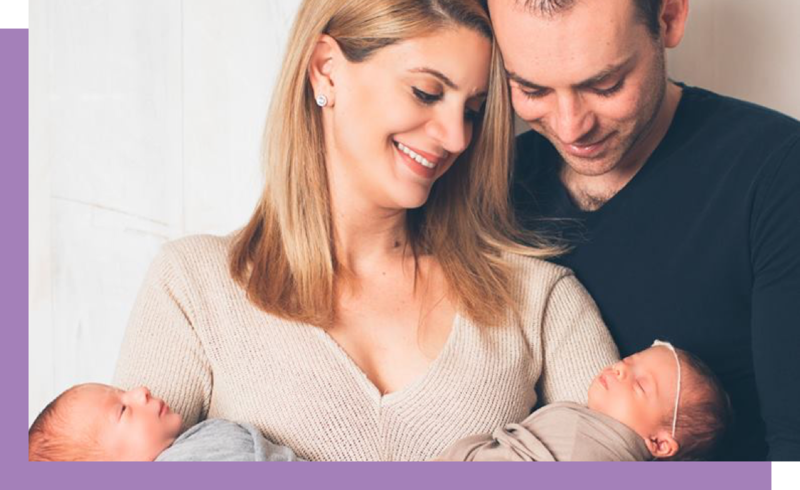 However, since many infants are not ready to eat solid food until after 6 months, our system allows parents to start as early as the guidelines suggest while the baby is still drinking breast milk or formula. Why is Ready, Set, Food! the best option to introduce and sustain food allergen exposure? As physicians and parents, we developed Ready, Set, Food! for our children. With just three organic ingredients and a transparent, guided system, it's our mission to make early and sustained allergy introduction safe and easy, even for the pickiest of little eaters. We provide the peace of mind parents need as their babies begin their introduction to food by easing the burden on parents deciding what amount of each of these foods to expose their child to, in what order, and when and how to increase the exposure. There are many ways to safely introduce potential food allergens to babies during the first year of life, but some ways are easier than others. 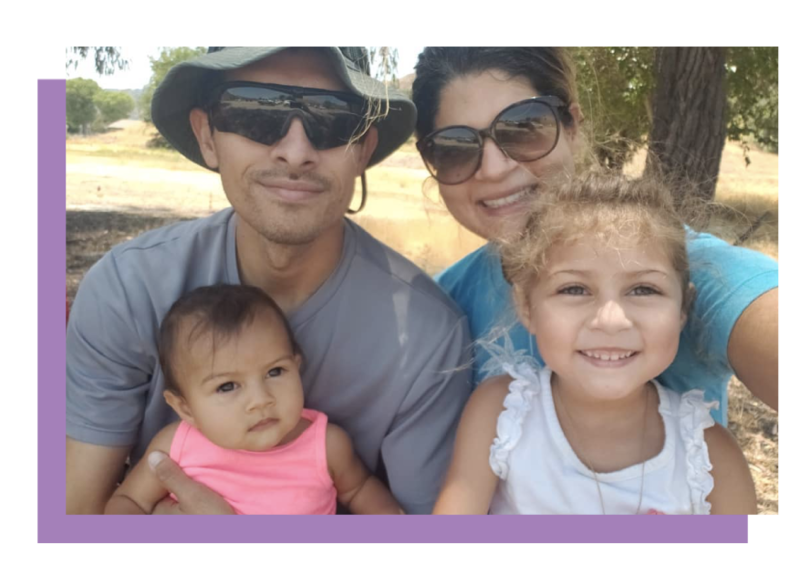 Each family has a different set of health conditions, lifestyle circumstances, and concerns or fears, so knowing the options out there and finding the best method for your family is vitally important. How long would I need to use Ready, Set, Food! to ensure the most effectiveness of early allergen introduction? The clinical trials and current guidelines recommend 3 to 6+ months of regular, sustained exposure to common allergenic foods. In fact, in the LEAP study, babies were exposed to allergens for 4 years! It all depends on when a parent begins early allergen introduction, but the right time to finish early allergen introduction is when a baby is regularly consuming peanut, egg, and dairy at least three times per week through solid food. For many families, this will be about 6 months from starting. Do you only offer subscription plans? Is there a one-time purchase option? Yes, on our website we only offer subscription plans. That means that when you order a product from us, you are signing up for a recurring subscription where you’ll receive one box of Ready, Set, Food! right to your door each month, and your credit card will be charged each subsequent month until you cancel. If you’re not ready to commit to a recurring monthly subscription plan, we do offer a one-time purchase option which you can purchase directly on Amazon. Please note that since the key to food allergy prevention is regular, sustained exposure over time, we highly recommend our suite of subscription plans. Can I change from one subscription plan to another? Yes, absolutely. Please reach out to our customer support team via live chat or email and we’ll be happy to help you out. Can I delay my next shipment? If so, would it cost anything extra to do this? Yes, you absolutely can delay any upcoming shipments with no additional cost to do so. Simply connect with our customer support team to let us know when you’d like your next box to ship out, and we can take care of that for you. If you still have too much after your delay, feel free to contact us again. Once there, click the “Manage Subscriptions” button. Once there, you’ll see your active subscription(s), and under the “Actions” column, select “Edit”. You’ll then be directed to a window which will display an option “Next charge date”. Click “change next charge date”, enter the date you’d like to resume your subscription, and click “Save”. Once saved, you’re all set. If you’d like to review your new delivery schedule, simply select “Delivery schedule” on the left-hand menu to review. Is Ready, Set, Food! a treatment for existing food allergies? Ready, Set, Food! is not a treatment for existing food allergies. Instead, it aims to prevent food allergies before they develop. If your child has an existing allergy to peanut, egg, or cow’s milk, general medical guidelines strongly suggest that any products containing these ingredients (such as Ready, Set, Food!) should be strictly avoided. Is Ready, Set, Food! safe? I’m nervous about introducing allergenic foods to my baby. Ready, Set, Food! gradually introduces one food at a time, starting with very small amounts of each allergenic protein. In fact, our starting amounts are significantly less than what families typically first feed their infants. Our dosages by allergen are equivalent to less than 1 teaspoon of yogurt or cow’s milk, 1/8th teaspoon of peanut butter, and 1/250th of a cooked egg. Just three ingredients, all organic and sourced from farms right here in the United States. Given this, we are confident that our system provides the most gentle, yet methodical approach to exposing your baby to these common allergenic foods. My baby has eczema. Is Ready, Set, Food! right for him/her? Studies have determined that early allergen introduction is particularly important for this group, as infants with eczema actually have a 300% higher risk of developing food allergies. However, if your infant’s eczema is severe, current guidelines recommend having your baby tested for certain allergies prior to starting early allergen introduction. As with any feeding decision, we encourage parents of babies with eczema to discuss with their pediatrician. Can Ready, Set, Food! be used on older children? For the most effective results, we recommend starting Ready, Set, Food! before your baby is one year old. While we want to give all children the best head start against food allergies, if your baby is over the age of one, please discuss with your pediatrician before use. Can my baby use this product if they have a parent or sibling with a food allergy? Yes! Our product arrives in a box containing individually sealed, foil-lined packets of pre-measured powder. These packets are designed to be easily poured directly into your baby’s bottle or mixed into solid food without unintentional contact with the powder itself, significantly reducing the chance of exposing at-risk family members to the allergens. While current guidelines do not recommend routine screening of family members, please ask your doctor if you have questions prior to starting allergen introduction. Could my baby have a reaction to the product? If so, what could it be? For many babies, Ready, Set, Food! will be their first exposure to food other than breast milk or formula. We are confident our system is the most safe and methodical approach, but in some cases, reactions may occur, as with any new feeding routine. If your baby has a reaction to Ready, Set, Food!, please contact our customer support team via live chat or email as soon as possible to let us know. The classic “immediate-type” food allergy reaction almost always occurs within 2 hours of contact with, or ingestion of, the food, but most often occurs within just minutes. Symptoms can remain in one localized area or they can spread. In babies, hives, itchy rash, swelling of the lips and/or tongue, and vomiting are the classic symptoms of a food allergic reaction. Mild rashes that occur quickly and only in areas of direct contact with a food (such as the face and hands) are common in infants and may or may not indicate a classic food allergy. Gassiness, watery stool, or general fussiness is often not a sign of a food allergy reaction. Not every baby who experiences symptoms after eating certain foods has a food allergy or needs to avoid that food entirely, but if your child experiences any of the symptoms above, discontinue Ready, Set, Food! and consult your pediatrician. Proper evaluation by your pediatrician and/or an allergist can help sort out the likelihood of an allergy and the appropriate next steps. A food allergy is typically defined as an unfavorable reaction that occurs due to an abnormal immune system response to a food exposure. It occurs when a person’s immune system overreacts to a harmless food substance, treating it like a dangerous invader and mounting a response to it instead of ignoring it. Symptoms can range from mild to life-threatening. A food intolerance is an unfavorable reaction to a food that does not involve the immune system. One well-known example would be lactose intolerance, which is due to an enzyme deficiency. Food intolerances are typically less severe conditions that do not carry the same risk as food allergies or whole-body immune system reactions, such as anaphylaxis. Both food allergies and food intolerances can make someone feel unwell, and it can sometimes be difficult to tell the difference between a food allergy and food intolerance. If you are concerned about food-related symptoms in your baby, an appropriate evaluation by a pediatrician and/or an allergist can provide useful guidance. What is early allergen introduction, and what does it mean for my baby? Early allergen introduction is the process of gradually introducing common allergenic foods to your baby as early as four months of age. For years, physicians had advised parents to delay introducing their infants to highly allergenic foods like peanuts, eggs, and dairy in an effort to ward off allergies. However, recent groundbreaking clinical trials have offered scientific evidence that there is no benefit to delaying introduction of allergenic foods like peanuts, eggs, and cow’s milk to infants beyond 4 to 6 months of age. In fact, the data demonstrates that delaying the introduction of these foods may increase your baby’s risk of developing allergies. Therefore, early and sustained introduction of allergenic foods can help prevent food allergies. How late is too late to start early allergen introduction? In the major clinical trials, babies started as late as 11 months and still found a reduction in food allergies. So while it's better to start at an earlier age, we recommend starting as soon as possible, as long as your baby is under one year of age. If your baby is over one year of age, please consult with your pediatrician on how to best begin with early allergen introduction. Why recommend early allergen introduction for all children and not exclusively those at risk? All babies are at risk for developing food allergies. While babies with a food allergy family history or eczema are at higher risk, studies conclusively show that over 50% of all food allergies occur in children with no direct family history of food allergy. As a baby’s immune system develops, parents only get one chance for creating a positive response to allergenic foods. What are the current guidelines? Where did they come from? 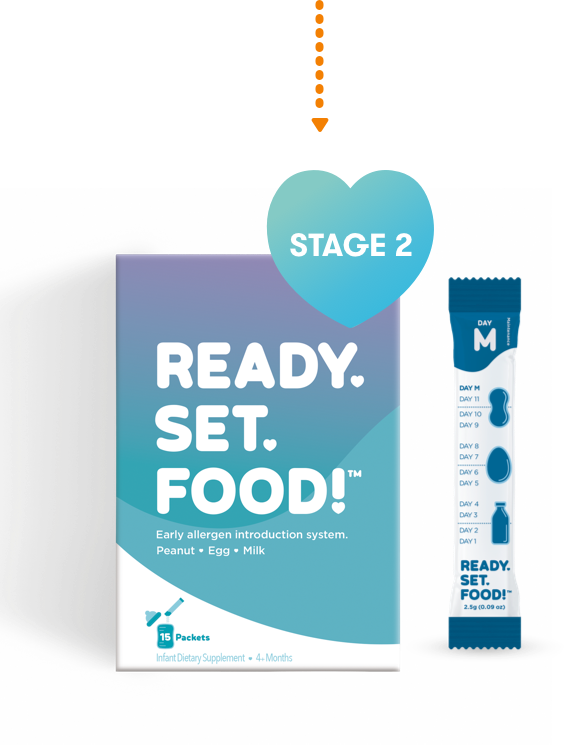 The current guidelines for early allergen introduction are to introduce and sustain small amounts of common allergenic foods between 4 and 6 months of age. These guidelines are supported by modern scientific studies performed in recent years. These new guidelines were noteworthy because for decades, many experts (particularly pediatricians and allergists) had been recommending that infants avoid potential allergens during their first year, particularly peanut. Specifically, in 2017, the AAP (American Academy of Pediatrics), NIH (National Institutes of Health), and FDA (Food and Drug Administration) all confirmed that feeding your baby peanut-containing foods early and often helps prevent peanut allergy. Ready, Set, Food! is a science-based product that was developed as a result of these guidelines and three recent clinical studies that were all independently funded and commissioned to determine the role of allergenic food introduction before six months of age in food allergy prevention. These pivotal studies are the LEAP (Learning Early About Peanut Allergy) study, the EAT (Enquiring About Tolerance) study, and the PETIT (Prevention of Egg Allergy in High-Risk Infants with Eczema) study. You can learn more in depth about these studies by viewing the full studies or their summaries here or here on our website. The LEAP study, performed in the United Kingdom and published in the New England Journal of Medicine in 2015 (and updated in 2016), was the first large-scale study of 640 babies that concluded peanut consumption between 4 and 11 months of age reduced the rate of peanut allergy development in these babies by 81%. The EAT study, performed in the United Kingdom and published in the New England Journal of Medicine in 2016, was a study of 1,300 babies with no risk factors who were given six allergens (peanut, egg, milk, white fish, sesame, and wheat) from 3 to 6 months of age. The study concluded that early and sustained consumption of peanut and egg by these babies led to a 67% reduction in common food allergy development. The PETIT study, performed in Japan and published in The Lancet in 2016, was a study of 147 babies with eczema who were given cooked egg from 4 - 10 months in a stepwise (low to high dose) dosing method. The study concluded that early and sustained exposure to egg reduced the risk of egg allergy development in these babies by 79%. I consistently consumed peanut, egg, and milk during pregnancy and/or while breastfeeding. Do I still need to do early allergen introduction? Currently, doctors and scientists do not believe that specific maternal diets during pregnancy or breastfeeding are enough to reduce the risk of food allergies, but this area is still being studied. Although breastfeeding imparts countless benefits for mother and child and is highly recommended when possible, there is still inconclusive evidence proving that breastfeeding alone can reduce a baby’s risk of developing food allergies. Therefore, in addition to breastfeeding, early and sustained allergen introduction is recommended as a part of a baby’s feeding routine, regardless of the mother’s diet. What do I do if I’m exclusively breastfeeding and my baby isn’t ready for solid foods at 4 months? Current NIH and AAP guidelines clearly recommend introducing allergens as early as 4 months of age, but we understand that this may be earlier than when many parents want to introduce solids. That’s exactly why we designed Ready, Set, Food! to easily mix with breast milk. Given this, breastfeeding mothers can continue to exclusively nurse without having to introduce solids before their baby is ready to eat, while at the same time being able to help lower their child’s risk of developing food allergies. The landmark clinical trials on food allergy prevention also showed that early allergen introduction had no negative impact on breastfeeding. What’s the difference between your subscription plans? We currently offer three different subscription plans on our website: a flexible, month-to-month subscription plan, a 3 month subscription plan, and a 6 month subscription plan. Our flexible, month-to-month subscription plan is exactly as it sounds. You can use the product for as little or as long as you want, you can cancel at any time with no cancellation fees, and you’ll receive one box to your door every 30 days. Each month’s new shipment will be accompanied with a monthly charge to the payment method you used when you made your initial purchase. Our 3 month subscription plan offers a discount for ordering 3 months up front, though you will still receive one box to your door every 30 days for a 3 month period. As you near the end of your third month, you’ll receive email communication from Ready, Set, Food! with information on next steps to cancel, renew for another 3 months, or move to a flexible, month-to-month subscription. Due to the discounted savings, our 3 month subscription plans are not eligible for refunds due to early cancellations. Our 6 month subscription plan offers an even greater discount for ordering 6 months up front, though you will still receive one box to your door every 30 days for a 6 month period. As you near the end of your sixth month, you’ll receive email communication from Ready, Set, Food! with information on next steps to cancel or move to a flexible, month-to-month subscription. Due to the even more discounted savings, our 6 month subscription plans are not eligible for refunds due to early cancellations. What’s your refund and cancellation policy? Cancellations: flexible subscription plan (our month-to-month subscription) cancellation requests will be honored at any time, but will apply for the upcoming recurring subscription period. Prepaid subscription plan cancellation requests will be honored upon completion of the initial prepaid period (3 or 6 months). Refunds: refunds requested after a month-to-month subscription payment has been processed will not be honored, though each request is reviewed on a case-by-case basis at Ready, Set, Food!’s own discretion. Prepaid subscription plans (our 3 month and 6 month subscriptions) are completely non-refundable. To request a refund or a cancellation, connect with our customer support team via live chat below or email, or check out this question on how to cancel yourself in your account portal. When you sign up for our Refer A Friend program, you will be emailed a unique referral code, as well as a shareable link. You can share this code with your friends and they can apply it at checkout to receive an instant $25 off any subscription. Once your friend completes their first month and continues onto the second month of their subscription, then you will receive $25! Do I need to be a Ready, Set, Food! customer in order to join the program? No, you do not need to be a customer in order to join our program and refer your friends. The program is open to anyone, whether they are an active customer or just want to share our product. If you are not currently a customer, we will send you a Visa gift card instead of account credit. When do I get paid? How do I get paid? You will get paid when your friend completes their first month and continues onto the second month of their subscription. If you are not a current Ready, Set, Food! customer, you will receive a $25 Visa gift card via email. If you are a Ready, Set, Food! Customer who has subscribed to a month-to-month subscription, you will receive $25 off your next recurring subscription charge. If you have purchased a 3 or a 6 month subscription, you will receive a $25 Visa gift card via email. Please contact our customer support via live chat below or email us at customerteam@readysetfood.com if you have any questions about your payout method or would like to change your payout method. What happens if I lose my referral code or didn’t receive an email? If you cannot find or didn’t receive your email with the referral code or shareable link, no problem. Simply return to the Refer A Friend page on our website, re-enter the same email and name information you originally used, and your code and shareable link will be displayed on screen. If you ever have any problems with your code or link, then feel free to contact our Customer Support via live chat below or email us at customerteam@readysetfood.com. Learn about the Ready, Set, Food! approach. Learn more about the landmark studies on early allergen introduction.